I can write about oysters and clams and life and death, and occasionally hear a voice from here, from there. Take on milk, however.....who knew cows were sacred? No matter--the thermometer rose over 30 degrees today to a balmy 43 degrees Fahrenheit. The snow is melting, the daffodils and crocuses are reaching up to the sky, and the sun creeps upward. Brighid returns. Any day now the tiger lilies will sprout--and when they do, I graze. Early spring is a wonderful time to nibble on plants. I do not spend a whole lot of time discussing my spring grazing habits with my friends. I usually get an odd look, and there's no sense upping the competition. Nibbling on greens shortens the food chain--I tear off a piece of a plant outside, I eat it. I know where the plant grew, I know whether it got dusted by pesticides, and I know the plant's story. I become more local. Some folks worry about me. What about the risks? The same folks will buy their food from supermarkets, trusting strangers who have no interest in them. I suppose I should list the usual caveats here--don't eat something you don't recognize, don't nibble in fields that may have been sprayed, don't take advice from strangers on the internet, and make sure you wash anything you might eat. You should follow the same recommendations when eating anything from your supermarket as well. I may eat more tiger lilies than anyone in Bloomfield, maybe anyone else in the world. Leslie loves tiger lilies maybe even more than I do, but her love is more photonic than gustatory. How do you eat them? Find them poking out of the ground, tear off a shoot, and eat them. What do they taste like? Sweet and tender, with just a tiny hint of spiciness. If it smells like an onion or garlic, it likely is, and if it is, it should be safe (unless poisoned by humans). Euell Gibbons said all wild onions are safe, and I trust him. Euell Gibbons is the guru of wild foods--his book Stalking the Blue-Eyed Scallop is one of my all-time favorites. He started his adventures by foraging for his family while only 11 years old--his clan was hungry. Euell Gibbons was, among other things, a school teacher, a carpenter, a farmer, and a hobo, all honorable professions--I would be proud if my children pursued any of these fields. What do wild onions taste like? Well, oniony, only more so. I especially love to eat the leaves. I (mostly) admire Gandhi's life, and one of Gandhi's favorite foods was purslane. This weed grows all over the place--I tossed it into the compost for years. My Auntie Beth told me it's good, and Auntie Beth is always right. It is nutritious, ubiquitous, and delicious--the flavor has been described as salty/sour, but it tastes like, um, purslane. I love dandelions! You've got to get them before they start to flower, otherwise too bitter. Even then, though, if eaten raw they may be too bitter for many. You can pay good money at a fancy grocery store, or you can forage for them in your backyard. Should things get real tight for us here in Bloomfield, we have too little land to support our population. We have almost 50,000 people living on less than 5 1/2 square miles. Unless I develop a healthy appetite for asphalt, subsistence living here remains a fantastic dream. Still, nibbling on greens breaking through our earth here in spring reminds me how connected we all are to our land, even here in a crowded corner of the universe. 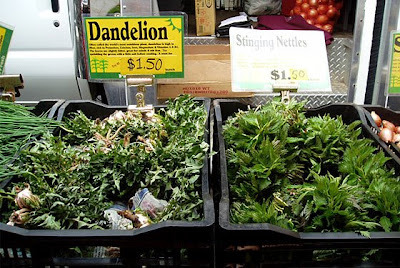 The dandelion greens are from New York magazine. Never tried a dandelion before. We do have some coming up here, although I might catch some strange looks if I start chewing on one. As far as growing my own food, it's not for a lack of space, but a lack of time. It's always fun to eat things you've grown yourself. I'm a bit further north so the glacier is still receding but this post made me realize that spring is coming. I also graze on some of these plants. I am now longing for purslane taboulleh and purslane raita; others dread it as a weed, I crave it as a food. I am a career changer student teaching right now. Thanks for the great blog - beer, milk, oysters, science, education and everything else! Bovine breast milk is a fine piece of alliteration, and one I'll likely inadvertently use it in the next decade or two, should I live that long. As far as gardening, think Nike--just do it. Throw some dill seeds in it, or basil. You cannot go wrong. The strange looks from folks is part of the fun. If time is an issue, just chunk some dill or radish seeds in the ground, and forget about them. Better yet, throw some strawberry plants in a good spot--you never have to do anything once they get started except eat them. Potatoes are another plant and forget veggie. Or squash. The perfect is the enemy of the good--a package of pumpkin seeds cost two bucks. Throw them in the ground and don't look back. If they grow, great! If not, well, two bucks is the cost of a lottery ticket. First off, I really enjoyed your blog--don't know how I missed it before, but I'm going to follow it now. Great stuff! I was a career changer as well--teaching is tough, but the returns are fantastic. The first couple of years will leave you as sleep deprived as having twin infants in your home, but it does get better. Ever take a shot at making some dandelion wine? My grandmother still has bottles in her basement from the prohibition era. I thought about it, but it's more sugar wine than anything else--unless you have a sekrit recipe that's mostly dandelions. Finally warming up here in Illinois. I will be able to get the sugar snap peas in this week. It's rained and rained over the past 24 hours so things should start to warm up. The bulbs are still hiding, it has been so cold. I have purslane aplenty in the garden. Haven't summoned the urge to eat it though as it also ends up in the compost. Maybe this year. We are expanding the garden to add two more raised beds so we can plant more greens. One of my students this week referred to the warm up outside as "pre-summer." Yep, we teach 'em good. Hokey smokes, I forgot about the peas! This morning I was going through a checklist--the lettuce has been planted, start the peppers inside in a week or so--but I kept thinking I was forgetting something. I'll put some in the ground today--thanks for the reminder! Hey Doyle, this is awesome! I just tasted purslane and wild onion in the last year and plan to again when possible. Ooooh yeah, blueberry and huckleberry too. But dandelions are a bit too bitter for eating raw for me, although.......ten days ago I went and harvested about 1/2 pound from my neighbors yard and boiled 'em with some ginger, molasses and tangerine, then added sugar and poured it over the last dregs of wild beer I had around to get it going. I can't wait to bottle it. I think I'm gonna like having wild greens this way. I am thrilled to see your words here--this country would be a whole lot better off if you taught biology. Yesterday Obama's comments on education depressed the snot out of me--either he made a deal with a few folks in the business world, and he realizes what he says is not true (but he's being expedient), or he truly believes it. Then you pop in talking of purslane and yeasts and beer and onion and blueberries, and, well, my whole day improved. America is not about Washington. It's about our backyards.